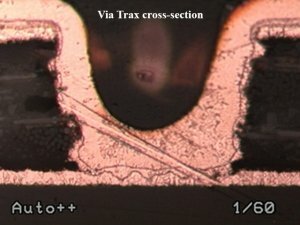 Via Trax™ technology is a laser surface preparation technique used to remove contaminates from the target pad. 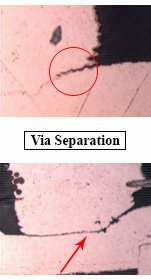 The resin or carbon contaminates are generally not visible under magnification and are invisible to CO2 laser drilling wavelengths. Even standard, post laser desmear or permanganate processes will not remove these surface contaminates that inhibit good plating adhesion. Backed by accelerated environmental testing, Via Trax has been proven to eliminate ‘hair-line’ fractures or separation that form between the plate line and the pad itself. Via Trax utilizes an ultraviolet wavelength that removes 2-4um of the copper surface including the carbon based contaminate. The surface topography is transformed into a rough surface of micron level peaks and valleys. The new surface acts as ‘micro-cleats’ that form an additional mechanical bond between the plating and the copper pad. 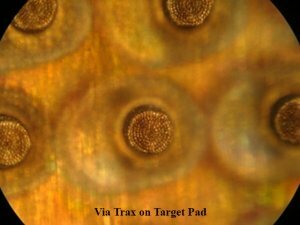 Proven to eliminate plating delamination to target pad via failures. Required process by Aerospace and Defense subcontractors. Direct copper drilling systems not capable of this process. Cleaner plating surface – The shorter UV wavelength removes any submicron resin from the target pad surface. Superior plating quality – The patterned surface provides an extra mechanical, locking bond for plating.